Franz Felkl, Naoko Takao and Jason Calloway perform music by Dorothy Hindman at Zimmermann’s Café Chamber Music on April 29. The Zimmermann’s Café Chamber Music series, modeled after the similarly named Leipzig establishment where J.S. Bach led a collegium musicum, features South Florida composers. 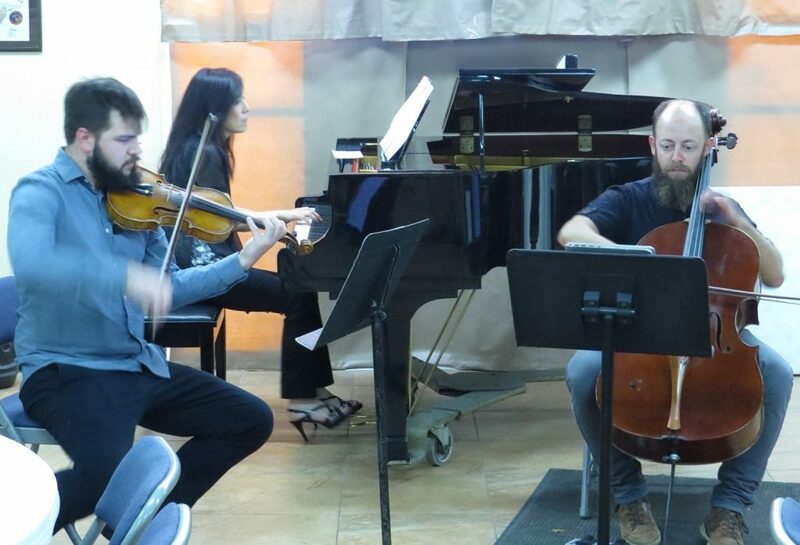 Chamber music by five of them was heard April 29 in a concert at Frazell Hall at St. Andrew’s Episcopal Church in Lake Worth. In addition to the music, the audience, seated at tables, listen to the composers commenting on their music beforehand and, afterward, respond to questions from them about that music. Raven Dance, for flute and guitar by Carlos Rafael Rivera (b. 1970) opened the program, performed by flutist Elissa Lakofsky and guitarist Celso Cano. The composer, known for his work in films and television, explained that the work’s genesis was a request (asked by another guitar duo) to write a piece based on a Balkan folk song for inclusion on a CD collection for Çedille Records. The result was Rivera’s elaboration of the Vranjanski čoček, a Serbian dance form in ¾ and 3/8 meter. The performers made it a lively divertissement. The 7/8 meter suggests a sense of motion. As I listened to the performances I was strongly reminded of the music of Darius Milhaud, despite the fact that Bies’s score pointed to no specific influences. Pianist Lisa Leonard, violinist Tina Raimondi and cellist Susan Moyer Bergeron brought out the music’s genial atmosphere most attractively. Each of the three instruments has distinct material introduced gradually. Later, the material becomes more interactive and integrated, “creating a unified statement.” Originally scored for clarinet, violin and cello, on this occasion the performers were Margaret Donaghue Flavin, clarinet; Jason Calloway, cello; and Naoko Takao, piano. As the composer was present for the performance, the version doubtless had his approval. Four singers took the place of the instrumentalists for two a cappella selections by Robert Hebble (b. 1934), a setting of “He Is Risen” and an arrangement of a Bach Prelude in E minor to the text, “Incline Thine Ear.” Both were sung by a quartet of Ashley Leland, soprano; Jerri Goffe, alto; Shane Thomas Jr., tenor; and Mark Young, bass. The acoustics of the low-ceilinged room worked against a blended vocal sound. With one voice on a part, it would have been better to have heard them in the adjacent church. As it was, where they were exposed weakness in their intonation that crept in near the end. Jerusalem Windows by Dorothy Hindman was last on the program, a piano trio that takes its title from 12 stained glass windows by Marc Chagall installed in a Jerusalem synagogue portraying the 12 tribes of Israel. Based on six themes, not always readily discernible, Hindman’s work is colorful and agitated. Its acrid colors often reminded me of Aaron Copland’s 1928 trio Vitebsk. That shtetl was Chagall’s birthplace and he often utilized fanciful memories of it in his work. “The music is wild, complex and rich,” wrote the composer, “inviting the listener’s ear to travel over it in the way that the eye travels over a Chagall.” The players (Takao, piano; Franz Felkl, violin, and Calloway, cello), played a lively account, although the violinist’s tone grew harsh in the highest register. Editor’s note: ArtsPaper founder and editor-in-chief Greg Stepanich is also the co-founder of Zimmermann’s Café. He was not involved in the writing of this review.